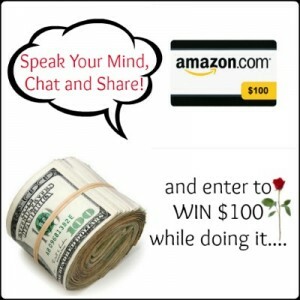 Welcome to the Comment Starter $100 Amazon Gift Code or Paypal Cash Giveaway! This giveaway is special!!! There are no pages to “like” or “follow”. As bloggers we like to have conversations with our readers….this is just a way to get the conversation started. I wanted to get you (my lovely readers) the opportunity to win this great $100 prize because I appreciate you all and would love to get some great conversations going! The holidays are just around the corner and who doesn’t want a little extra cash to spend?! Giveaway ends September 26, 2013 at 11:59pm, open worldwide, ages 18+. To enter please use the Rafflecopter form below. Good luck! Disclosure: Mommy Digger did not receive compensation for this giveaway & all opinion are their own.